It's easy to criticize. And fun, too. Especially when the target is Mattel, a company that's being run so poorly that they've already destroyed one incredibly popular series and are on the verge of doing the same to another. When it was announced that Mattel was taking over the DC Comics license from longtime holder Hasbro, fans were elated: the Four Horsemen would be handling the sculpt and it would be an opportunity to get away from the endless variations and neon nightmares that Hasbro had been giving us. Of course, an opportunity isn't a guarantee, and Mattel wasted no time in falling back into the same destructive patterns. Batman has, easily, the most intriguing set of villains every arrayed against a single protagonist. Superman fights Lex Luthor. Captain America fights the Red Skull. Only Spider-Man comes close in terms of sheer numbers of important foes, but Bats has had an extra thirty years to get his enemies together. How sad is it, then, that Mattel is only giving us one villain per series of figures, mixed in among the half dozen new Bat-costumes? It's truly pathetic, but so far we only have the Joker, Mr. Freeze and Killer Croc. 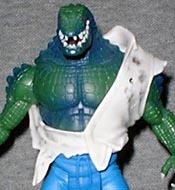 Waylon Jones earned the nickname "Killer Croc" due to the skin condition that left him with a tough, scaly hide. After working as a professional wrestler for a time, he found life as a criminal easier and made his way to Gotham City, becoming one of Batman's strongest - if not necessarily "smartest" - foes. This "one villain per series" idea might not be so bad - Hasbro had a similar strategy - if the villains weren't then packed one to a case. Though the Batmen collect dust on the shelves, each line's villain barely has time to touch the pegs before he sells. The Horsemen have said that they didn't really get a lot of input from DC Comics about the figures, and that their work just happened to look so much like Jim Lee's recent redesigns because they were drawing on the same ideas. Croc is more of an animal than a man here, which is a departure - other than in Lee's work, Waylon has always seemed like an odd human. Definitely beastly, Croc allows the Horsemen to show off some of the sculpting skills they picked updating MotU's Whiplash. He's wearing tattered blue pants and a white shirt, but everywhere his skin is showing, he's got some truly crocodilian scales. The grooves between the scales are deep and dark, just as they should be, and he's painted with some nice shadows and highlights. 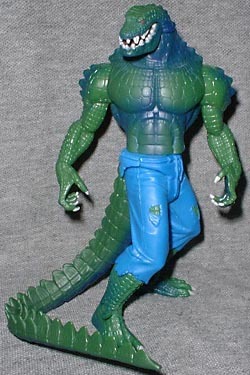 Croc has decent articulation, but nothing great: he moves at the neck, shoulders, wrists, waist, hips and ankles. It wouldn't have been hard to include elbows and knees but, you know, Mattel is lazy. His jaw moves, and is sping-loaded for champing action - move his left arm backwards, and the jaw opens. Packaged behind him on the blister is his tail, which is bendy and plugs into the base of his spine. The figure includes a generic little pipe as his sole accessory, and it can be held in either hand. You can remove his shirt with just a little effort if you like your giant green men burly and naked. Killer Croc is a good, solid action figure - he's playable, has a good sculpt and looks good with the rest of this line. If you can find him at retail, it's a good purchase, but eBay prices will probably make him seem pretty chintzy. The blister card was redesigned for this wave to have a "sewery, Killer Croc" feel - manhole cover, big claw, green sludge, all that. Even worse, then, that the character who inspired the change cannot be found on store shelves.